The Arizona Nonprofit Policy Council is an advisory group composed of individuals interested in public policy and advocacy for Arizona’s nonprofit sector. Participation in the council is open to members of the Alliance of Arizona Nonprofits and is primarily made up of professionals from the nonprofit sector who are working in or for a nonprofit organization. Other members include lobbyists or other experts in public policy who support the sector. Our goal is to have a council that accurately reflects and represents our diverse nonprofit community in Arizona. The Council provides critical insight and feedback on issues, opportunities and obstacles facing the nonprofit sector. Council members share their issues, concerns and viewpoints on a variety of nonprofit issues through productive discussion and information sharing. The Council helps mobilize the ‘grassroots’ and ‘grasstops’, and informs boards of directors, partners and the media on legislation, propositions or positions important to the nonprofit sector in Arizona. This helps shape the Alliance’s advocacy strategies and the formation of the Alliance’s annual legislative agenda, guided by the Alliance’s Policy Framework. The Council also helps plan advocacy related programs and events. Council members are also often invited to meet with policy makers and other leaders, or provide testimony at the legislature, as part of the Alliance’s ongoing advocacy efforts. Finally, the Council provides review and recommendations on legislative and policy issues to the full Alliance board for approval as necessary. Learn more about Advocacy & Public Policy at the Alliance by clicking here. Staff coordinates and provides ongoing education and information to Council members to keep them informed on local and national issues, trends and best practices. Council members also receive a monthly report from the National Council of Nonprofits at each meeting, providing insight and perspective on issues facing the sector on a broader scale. Also, council members have access to the legislative bill tracker and advocacy communication from the Alliance. 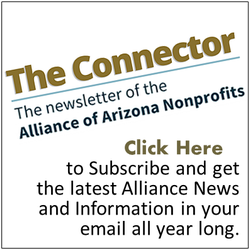 The Council is open to accepting new members year-round, and we are regularly looking for nonprofit leaders who represent the diversity of the communities and causes we support.If you are interested in learning more, please contact Alliance CEO, Kristen Merrifield at kristenm@arizonanonprofits.org. Meetings are normally held once a month on a Friday from 9-10:30am at the Alliance’s Central Phoenix office, with the option to call or video chat in from other parts of the state.